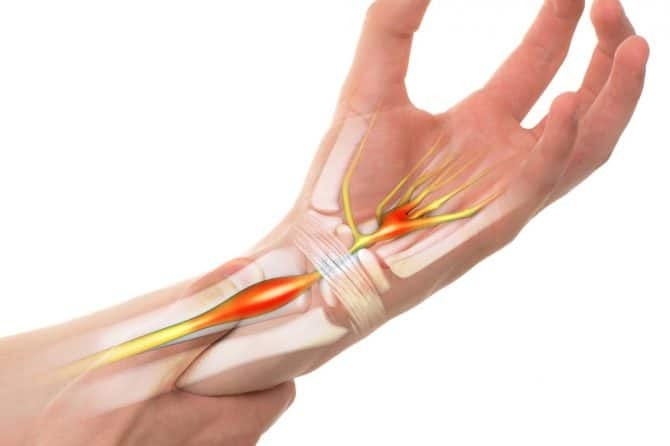 If you have tingling, numbness and weakness in the hand, which persist at night, you might be suffering from something called carpal tunnel syndrome. Up to 6% of adults globally develop the condition – which is nothing but a staggering number once you do the math. If you want to know whether you are among the affected ones, read on, as early diagnosis and treatment are crucial. 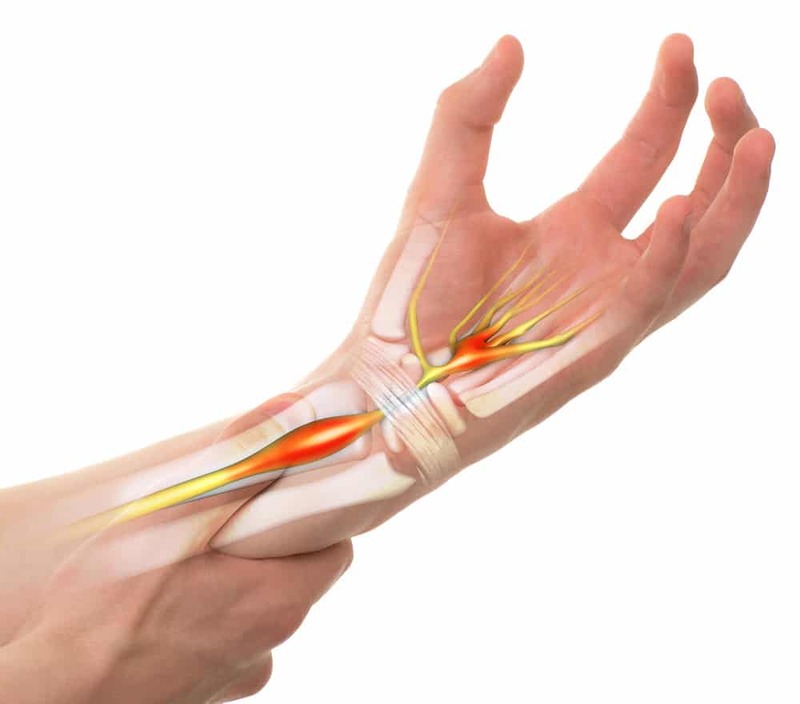 What is Carpal Tunnel Syndrome (CTS) and What Causes It? It’s a health condition affecting the arm. In order to explain it, we’ll touch on biology for a moment. There are three major nerves running from the upper arm to the hand and wrist. Of them, it is the median nerve that controls movement and sensation in all fingers but the little one. It moves through the carpal tunnel, which is a passageway consisting of ligaments and bones. For some reason, the tunnel can become inflamed, as a result of which it shrinks and begins to compress the median nerve. The excess pressure builds on, causing pain and immobility in the affected hand. And this is how the carpal tunnel syndrome occurs. As to why it happens, the reasons are plenty. Common risk factors are conditions like diabetes, rheumatoid arthritis, pregnancy, and hypothyroidism. Not to mention, repetitive motions of the wrist, such as typing, can trigger the disease. This is why people who spend their workdays tied to their desks are at a risk of developing the syndrome. Lastly, some people are born with smaller carpal tunnels or there might be anatomic differences which restrict the space for the nerve. Due to purely smaller sizes, some women are more likely to suffer from the condition. The symptoms will come and go and will be worse in the morning. Some will make certain activities difficult to perform, while others may even wake you up from sleep. Weakness. You may be lacking strength in your hand and develop an inclination to drop small objects. Sometimes the latter may be caused by weakness in the punching muscles of the thumb, which happen to be controlled by the same nerve. In addition, it could be due to a loss of awareness where your limb is in space, which is called proprioception. Numbness or a tingling sensation that may move from your wrist to your upper arm. The most affected areas are the index, thumb, middle, and ring fingers. You may also get a sensation resembling an electric shock in that area. Usually, these symptoms emerge when you are holding a newspaper, phone or steering wheel. Hand and wrist pain that may travel up your arm. Again, it affects primarily the first four fingers, except for the little finger, which is not controlled by the median nerve. Clumsiness in your affected hand. It may lead to an inability to button your clothes, tie your shoes, hold a pencil, or do other fine movements. To diagnose carpal tunnel syndrome, your doctor will evaluate your health condition by asking questions about your medical history and symptoms. They will also examine your hand. One way to do this is using the Tinel test or Tinel’s sign. They will place your wrist in a neutral position, with palms facing up, tapping continuously on the nerve to see if it triggers tingling or numbness in your fingers. Another way to indicate the syndrome is by performing the Phalen’s test. You will be asked to flex your wrists and hold them together for about a minute, pushing the hands’ dorsal surfaces together. If you start to feel tingling in your fingers, that’s a positive test. Aside from this, the doctor will recommend the following tests: X-rays, ultrasound, MRI scans, and electrophysiological tests. The latter will help find out if there is pressure on the median nerve or other nerve problems that may be adding to the symptoms. The specialist will go for a conservative treatment if your symptoms are mild and diagnosed early. Here are the options. Nonsteroidal anti-inflammatory drugs. You may be prescribed medication to control pain, numbness, tingling, etc., and reduce swelling. Splinting or bracing. You might have to wear a splint at night to prevent yourself from bending the fingers in your sleep. This will aid you in maintaining a neutral wrist position and remove pressure from the nerve. A wrist splint may be beneficial during the day too, especially when you are involved in activities that worsen the symptoms. Corticosteroid injections. Cortisone, or corticosteroid, has anti-inflammatory properties and is great for pain relief. Unfortunately, the effects are sometimes short term. The hormone can be injected directly into the carpal tunnel, helping comfort an outburst of symptoms. Nerve gliding exercises. Your therapist or doctor may recommend you specific exercises which will give the median nerve more freedom to move within the carpal tunnel. Changes in your activity. If your recreational and work activities involve keeping your wrist extended or flexed for too long, this may aggravate the symptoms. Modifying those activities can slow down the disease. If the conservative methods don’t manage to soothe the symptoms, you may need to go under the knife. The procedure is generally referred to as “carpal tunnel release” and is performed on an outpatient basis by orthopaedic surgeons. The main objective is to alleviate pressure with one of two techniques available – open or endoscopic. The patient is either given local anaesthesia – i.e. their hand and arm are numbed – or is put to sleep. Open carpal tunnel release surgery. The specialist makes a small cut on the palm side of the hand and divides the transverse carpal ligament. The purpose of this is to make the tunnel bigger so that the median nerve is not put pressure on. The ligament may grow back after the operation, however, there will still be enough room for the nerve. Endoscopic carpal tunnel release. 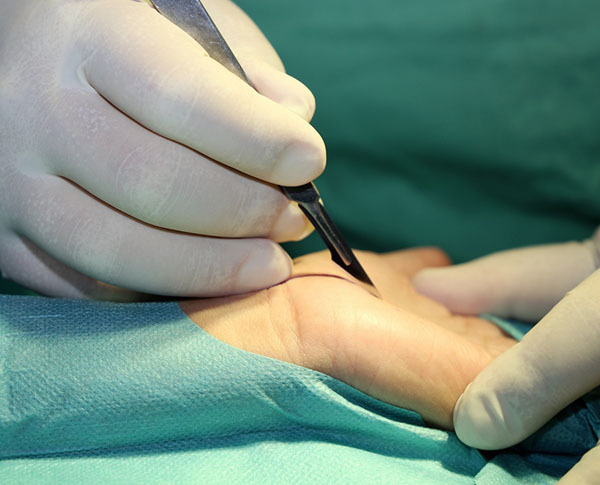 With this technique, the surgeon makes small cuts in the skin and engages an endoscope in the procedure. (This is a tubular instrument with a miniature camera at one end which is illuminated. It helps examine cavities in the body as well as the inside of organs.) Then the surgeon divides the carpal ligament using a special knife. Each of these techniques carries a certain amount of risk, including infection, bleeding, and nerve injury or aggravation. Needless to say, your doctor will do what it takes to keep those complications to a minimum, but you need to be aware of them anyway. In most cases, the surgery takes ten minutes and has a fast recovery rate. Unless your job entails physical labour, you are free to return to normal activities right away. However, complete recovery might take a year for some patients. After the operation, you may be sent to a hand therapist who will give you tips on how to maximise recovery. In some cases, the problem can recur, which will necessitate additional treatment. Patients who experience other conditions parallel to the carpal tunnel syndrome, like tendonitis and arthritis, are likely to recover more slowly. Then again, if you have waited too long to undergo treatment, complete recovery of the nerve and muscle might not be possible. What Will Happen If The Syndrome Is Left Intact? It is not recommended to delay treatment once you know that you do have a problem. Over time, your condition will worsen. If you wait long enough, the muscle in that part of the arm will atrophy. Wait a little bit more and the harm you’ve done to the limb will be permanent, i.e. the damage will be irreversible. In the end, your hand will be completely numb and doctors will not be able to do much about it. Improve posture. When your posture is incorrect, the shoulder and neck muscles shorten, causing neck nerve compression. It goes without saying that this can affect your hands, wrists, and fingers. Take breaks as often as you can. Alternate tasks every now and then if possible. Bend and stretch your hands gently at regular intervals. Make sure your hands are warm. If you tend to work in a cold environment and there is no way to control the temperature, then use gloves to cover your hands. Change the mouse if necessary. If the computer mouse you are using does not fit your hands well or does not feel comfortable, get a new one. Try to maintain a relaxed position. Make sure the keyboard is placed at elbow height. It can be a little lower than that, but not too much. Don’t bend your wrists all the way. If you think you might have this condition, don’t take forever to seek medical advice. The sooner you know what’s going on, the better.